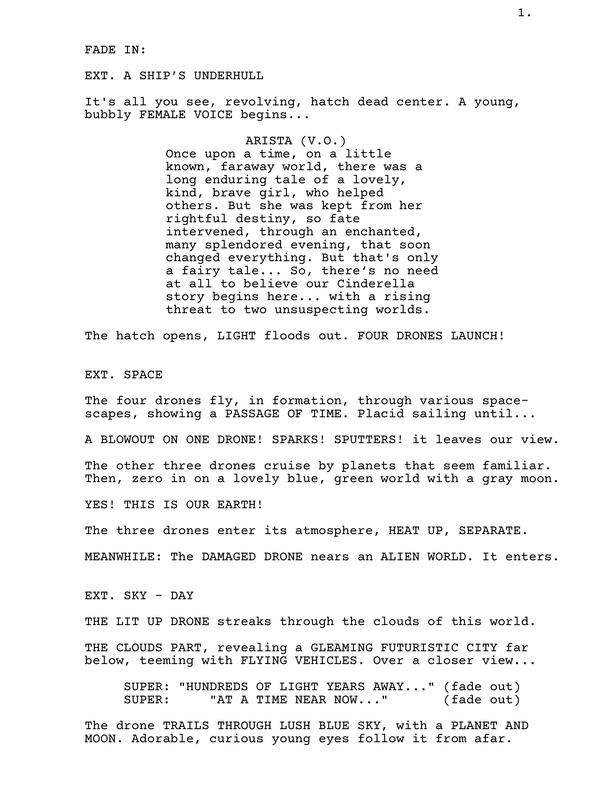 This is a script I have been working on for a couple years and entered in a few contests. In true beginner's luck fashion, an earlier version placed in the quarter finals of the 2016 Screencraft family friendly competition. But since then, no placements (entered 3 contests since then, with later drafts) even though I believe my later drafts were much better. Coverages have overall liked it, said the material and lore has real potential but it needed to be tightened up and was dialog heavy. The villain also need to have more of a presence. This latest rewrite trimmed away five pages (with maybe another to go, still working on it) and I dug deeper to find ways to get things across with less dialog and there were other big changes. They say page one should by a good teaser to hook you for more, so I posted page one because everybody can read a page one. And if there is interest in reading a more finished work in progress, I will post the whole thing soon. Hundreds of light years away, destiny beckons princess like heroes to battle an evil wannabe dictator's plan to enslave refugees from many worlds. And also, obliterate the people of a little known, faraway world that changes everything they thought they knew... A world called Earth. first of all congrats to your earlier success. Always a pleasure to hear when colleagues receive the admiration they truly deserve. The intro is powerful, but the flow sometimes a little bit too chopped up. The style reminds me of a mix of different Directors like Quentin. You set the right frame for a science fiction story, but I think that only one page does not always do the job for this genre. If one page, then one with a little bit more dialog to get a kind of sense of the environment, the characters and the unique message this story contains. I like that she began with a lovely but sad speech, so good work on that. Did you wrote short biographies about your main characters? If not, do so to understand more of what they need to say to reveal glimpses into their soul during every sentence. The title is uninteresting and too close to the Land that Time Forgot. In the far reaches of the galaxy, princess warriors battle an evil dictator's plan to enslave the people of earth. So, I was not hopeful when I opened the script. The opening VO is poor IMO. Too clunky - too long and probably not needed. The rest of the page is real solid and recovered enough to hold my interest. I agree with everything eldave1 has said above with the exception of his last line. I don't think the rest of the page is solid. Also, last scene has us in the sky of an alien planet, then you tell us there is a planet and moon - another planet? are you talking about the planet we are already at? if so, no need to tell us again, it has already been established that we are there. There's enough here to like. I'd read on, if it were a later, cleaned-up draft. I agree on limiting the use of CAPS. Very distracting. You need to trust the reader more. I like the juxtaposition in the monologue. It works. But, agree that it's too long. I'd say only a line or two about the fairy tale - just enough to establish the tone, then the last line. Count me in on voting for a new title. And, finally, I don't understand the last line at all... we're in the sky, unless we're not. If we're not, we'll need a new slug. And, if we're in the sky... can we see those adorable blue eyes from afar? Like I said, though: cleaned up, I'd read on. Thanks for all your feedback. Perhaps soon I will post more pages so those interested can have a better idea of how it proceeds.